Given the extent of published research pieces finding a positive relationship between glyphosate (the active ingredient in Monsanto’s best-selling herbicide RoundUp) and cancer, it isn’t very jaw-dropping anymore to hear of a new study coming to similar conclusions. Indeed, one new review and a series of meta-analyses of 30 years-worth of research has found that Monsanto’s RoundUp could be causing blood cancers in the lymph glands, specifically non-Hodgkin lymphoma (NHL). The review focused on 30 years-worth of epidemiologic research on the connection between NHL and exposure to ingredients used in agricultural pesticides. The researchers examined the results from 44 papers, which found an association between NHL and 21 pesticide chemical groups and 80 active ingredients. The meta-analyses showed that phenoxy herbicides, carbamate insecticides, organophosphorus insecticides and the active ingredient lindane, an organochlorine insecticide, were positively associated with NHL. But of course this isn’t the only study to find a connection between pesticides, glyphosate, and cancer. One groundbreaking study has found that glyphosate is responsible for fueling breast cancer by increasing the number of breast cancer cells through cell growth and cell division. The effects are so potent, in fact, that the cancer cell proliferation is driven even when we’re talking about RoundUp in the parts-per-trillion (PPT) range. These are just a few of the countless studies revealing the many dangers of RoundUp, pesticides, and glyphosate. It is these findings that are causing nations around the world to limit pesticide use, or ban the ingredients altogether. Sri Lanka became the first country to ban Monsanto’s toxic RoundUp Ready chemical, glyphosate, in light of recent studies linking it to chronic kidney failure, while a full suspension of glyphosate is being demanded by the Brazilian Federal Public Prosecutor in the Federal District. What’s more, the Netherlands have passed a similar ban to Russia, Tasmania, and Mexico, disallowing the used of glyphosate-laced herbicides by the general public. It is time the United States makes a move of it’s own. 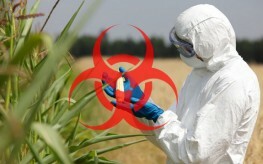 Just how many studies need to reveal glyphosate’s dangers before we ignite a ban of our own? Roundup isn’t a pesticide — a bug killer — although this article repeatedly misuses the term. It’s a herbicide — plant killer — commonly used on weeds and unwanted grasses I want some accurate information to decide whether to discontinue my use of Roundup, since I was just diagnosed with non-Hodgkin lymphoma and I’m looking to get away from what may have caused it. If you don’t really know what your’re talking about, you’re no help. Herbicides and pesticides are not the same thing.